Experience an unprecedented perspective on the city! Visiting Pisa Ancient Walls Trail, you could get a reduced ticket for the new exhibition at Palazzo Blu: "Explore. Moon and beyond"
The walkway of the Pisa’s Walls, with its 11 meters high, gives to the public the possibility to observe the city from an original perspective. 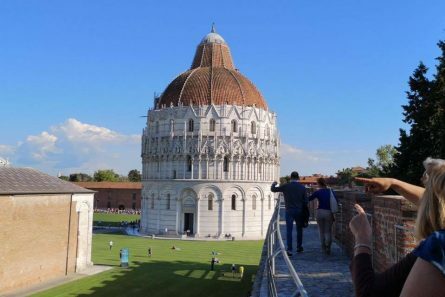 A pleasant walk to admire from above the typical Pisan overview, from Piazza dei Miracoli to Piazzetta Del Rosso. An itinerary that surprises the visitor for the beauty of the places, among recovered garden, archaeological and artistic treasures. The building of the Pisa’s Walls began in 1154 in the area of the city north of the Arno river; the construction lasted until 1161, followed by a further completion in 1284 in the area of Cittadella Vecchia.